A Glance at the Table of contents will show that his edition differs from the first in many respects. The additions and alterations that have been made both I matter and arrangement require a few words of explanation. The main body of the work is divided into four parts. The first part gives the general scope of Syntex and lays down the principal laws of Concord. The second part deals with Government, and gives principal rules in the Karaka Prakarana. In the third part are considered the more important Grammatical Forms, the meaning and use of which require explanation; such as several kinds of Participles, the Infinitive Mood, the ten Tenses and Moods. 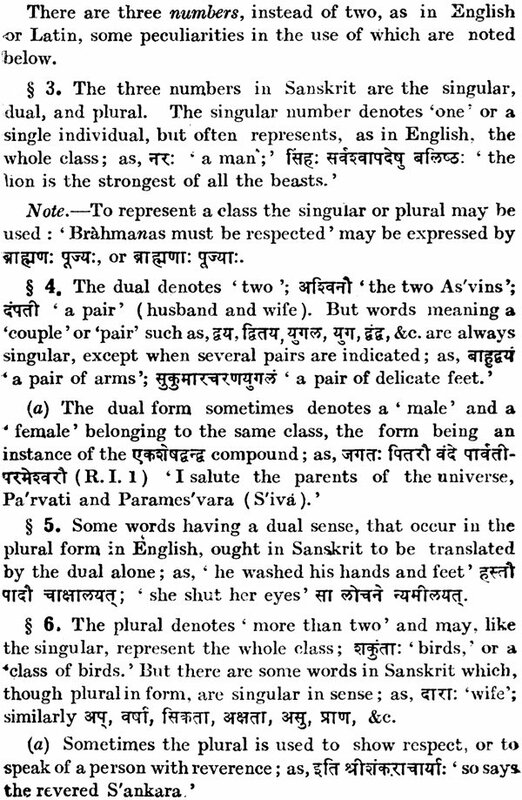 Particles, such as are most frequently used in Sanskrit Literature are also treated and illustrated, being alphabetically arranged and distributed over eight Lessons. 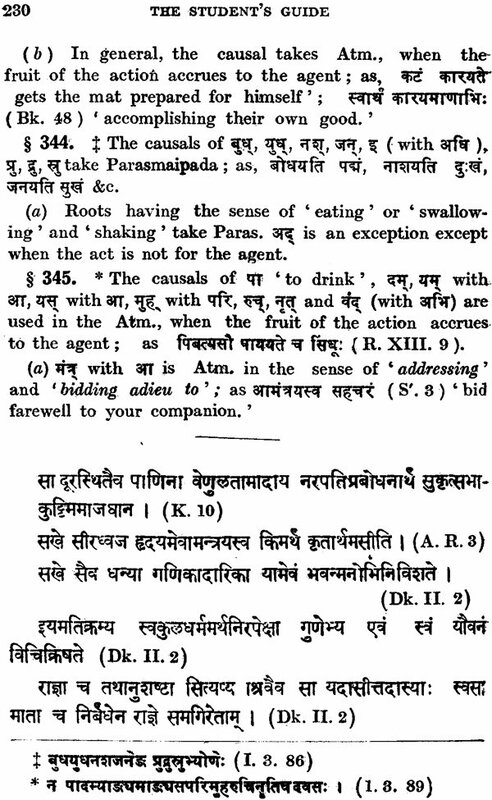 Some peculiarities of the Parasmaipada and Atmanepada-certain roots taking one or the other pada according as they are used in a particular sense or are preceded by certain prepositions-which were given in an Appendix in the first edition, have here been incorporated into the body of the work, and treated in two additional Lessons. 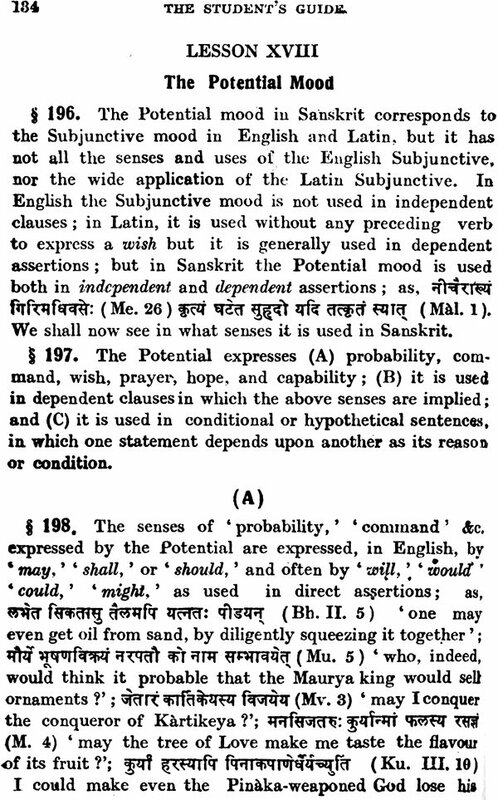 The fourth part gives matter not given in the first edition-the Analysis and Synthesis o Sanskrit Sentences. 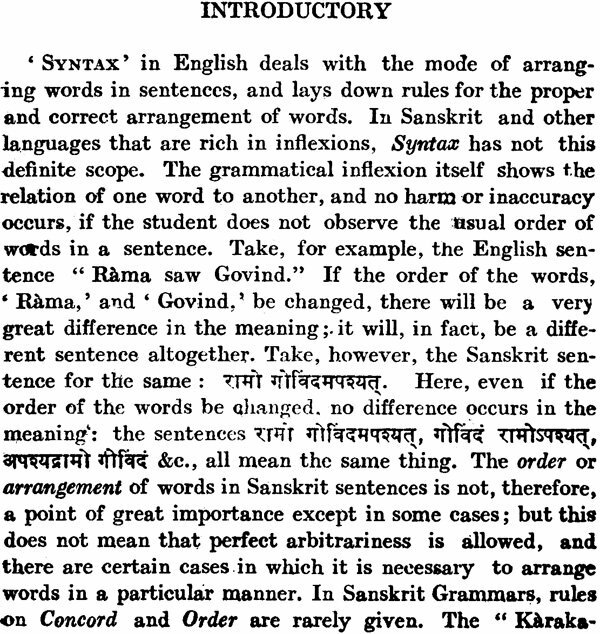 I have tried to apply the system of English analysis to Sanskrit Sentences, and in doing so I have illustrated the rules of English Grammar by examples from Sanskrit authors, making such additions and alterations as were necessitated by the peculiarity of the Sanskrit idiom. To some this portion may perhaps appear superfluous. 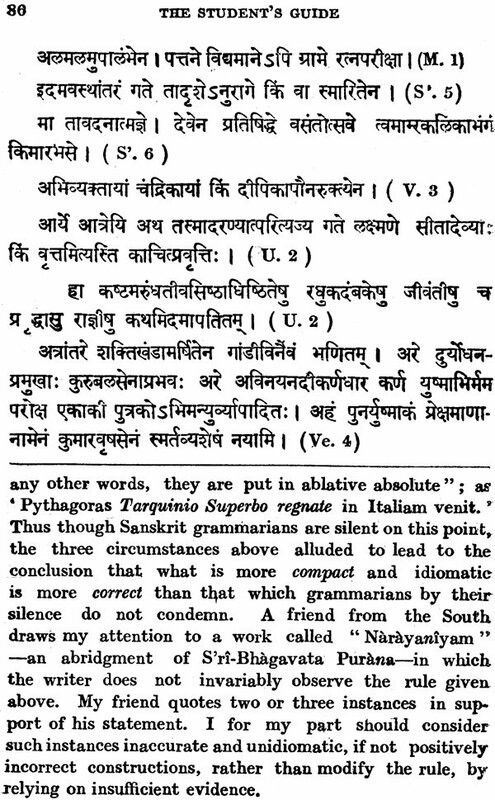 But my experience is that a correct knowledge of the relations subsisting between the different parts of a Sanskrit Sentence is highly useful to the students, not only in translating from Sanskrit into English, but also translating from English into Sanskrit, inasmuch as it clearly brigs to his notice the difference in construction between two languages, and in composing sentences. The general rules of Analysis are much the same in all languages, but their application is not easily understood. 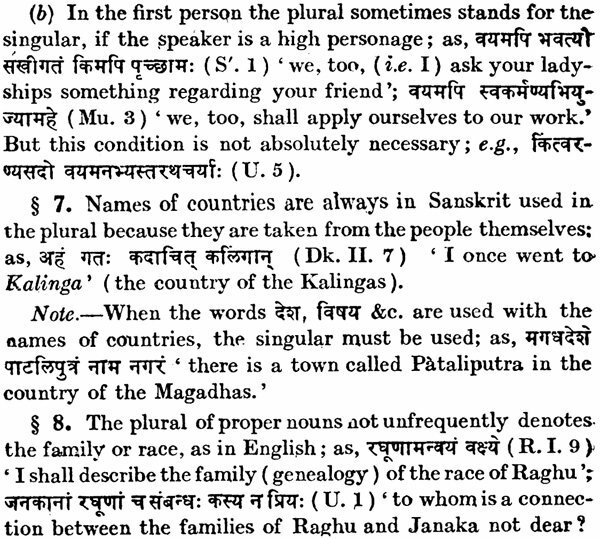 In Section II of this part some rules on the order of words have been given, mostly drawn from an examination of the construction of Sanskrit sentences and comparison with Latin idiom. The third Section takes up the Composition of sentences, where the student has to frame some sentences so as to apply the rules of analysis given in the first Section. Several exercises have, with this view, been given in this Section. 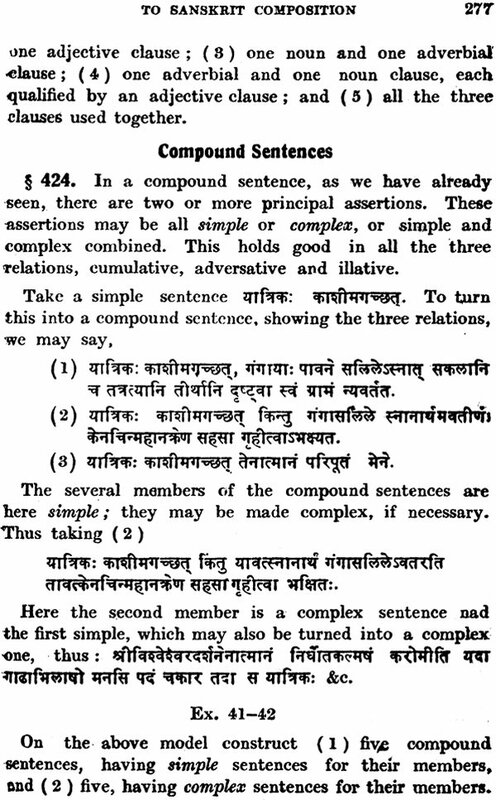 I am inclined to believe that these exercises, if carefully worked, will give the student considerable facility in writing a few sentences of original Sanskrit on a given subject. 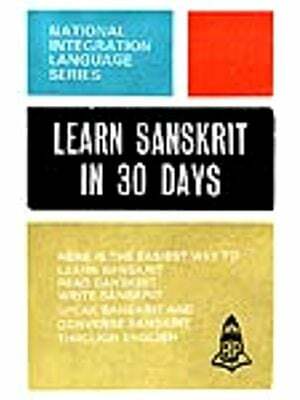 The student has also been shown how to paraphrase Sanskrit passages, and it is expected that, with the help of Analysis, he will be able to paraphrase in Sanskrit as he does in English. The fourth Section treats of Letter-writing, in which are given, with example and exercises, some of the common forms of letters. on this subject I have derived considerable help from a number of manuscripts, dealing with forms of writing - that were brought to my notice by Dr. Bhandarkar, and kindly placed at my disposal for some months. This edition differs also in the arrangement of matter. Each Lesson here consists of three parts; the first gives the rules with illustrations; the second and third give sentences for exercises. 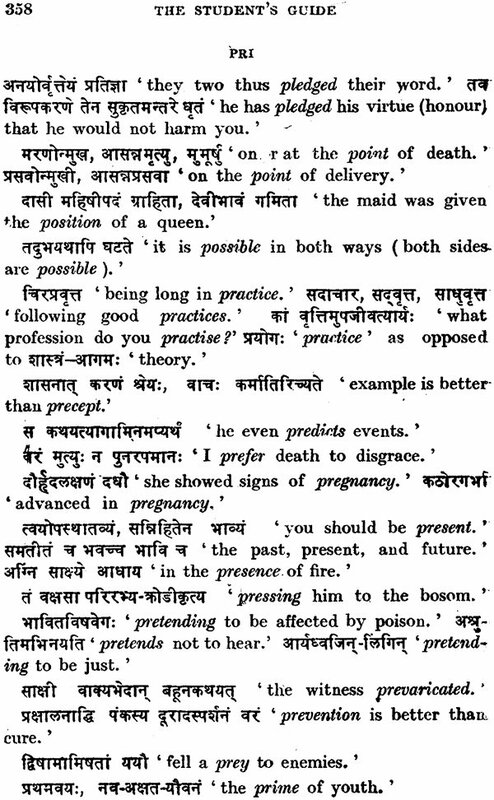 Choice Expressions and Idioms, which were in the former edition. Given after the rules, and the Sentences for Correction which were given last, have here been given after the Notes. The idioms have been arranged in the alphabetical order of the important words in their English equivalent, and a good many taken from standard authors have been added so as to increase the former number by over one-half. The Sentences for correction have been promiscuously arranged, and they may be attempted after the rules have been fully mastered. There is one more material change in arrangement that will not fail to strike the reader. 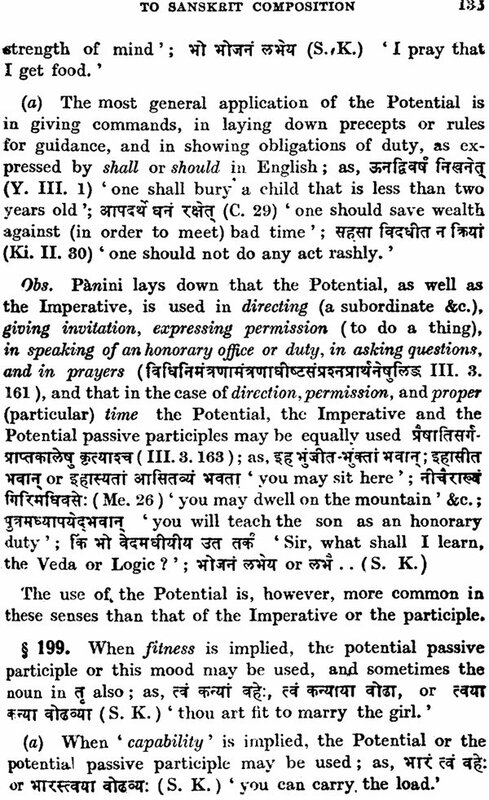 The Sanskrit sentences have been divided into two parts : those in large type for reading in class, and 'Additional Sentences for Exercise,' which may be read at home as additional reading. I have been obliged to make this division, not because I considered the number of sentences very large, as some of my critics did, but because the sentences, as they stood, were too many to be read by student in the ordinary course of class lessons. 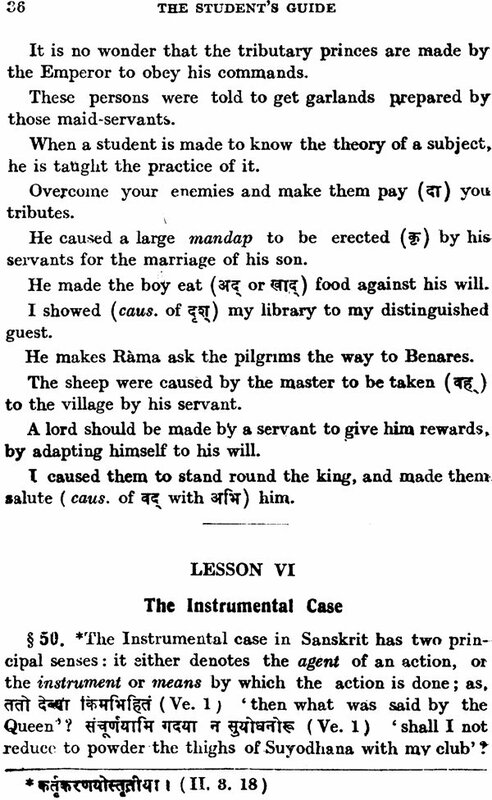 I myself did, and which other teachers also who did me the honour of teaching it to their pupils, must have done, namely to effect a division of the Sanskrit sentences. This has moreover, enabled me to add under the 'Additional Sentences' several passages from authors not previously drawn upon. The lesson on the nominative case in the first edition has been omitted as it was found to be superfluous, and that on Pronouns, being out of place in concord, has been transferred to Part III. The Appendix on the formation of the feminine of nouns and adjectives has been dropped. 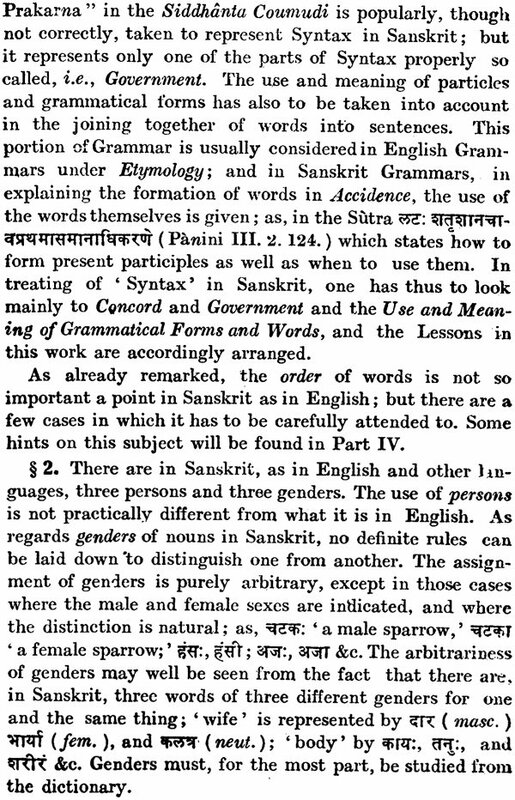 Other improvements made in this edition are two Glossaries-Sanskrit-English and English-Sanskrit-Which give the difficult words occurring in the exercises for translation, and an alphabetical Index of all the nouns, adjectives, roots, &c., which have given rise to syntactical or other rules. The want of the two Glossaries, more especially of the first, was much felt by students. The most ordinary words, which the student must have come across in his elementary course of study, have not been included. The importance of the Index need not be much dilated upon, since it facilitates reference to a very remarkable degree and is now regarded as almost a sine qua non of such words. For this I must thank Professor Max Muller, who was kind enough to suggest, among other things, this idea of giving an Index. The Notes, given after part IV, retain much of their former character. They are mostly intended to be explanatory. Individual words, being included in the Glossaries, not have here been repeated. There are the main additions and alteration made in this edition. Beside, the work has been most carefully revised throughout: indeed, it will be difficult to find a page which has not undergone careful revision. 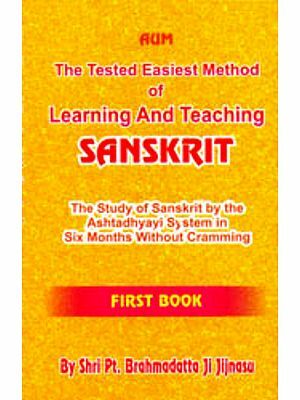 Several rules have been recast; and many more, drawn from a closer study of Sanskrit Grammar and the works of classical authors, have been added to each Lesson. 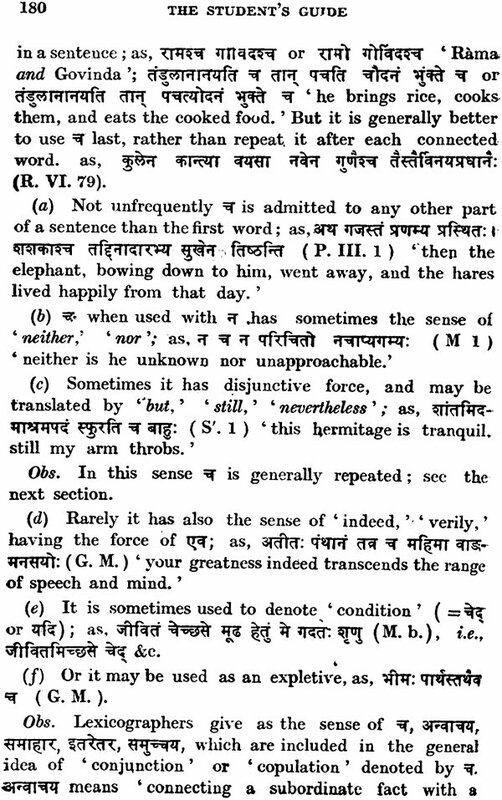 Throughout the book several Sanskrit passages have been added, either to the illustrative sentences, or to the sentences for exercise. The effect of this and the like additions has been to increase he matter by nearly one-half. Yet by a suitable arrangement of types, the volume of the work has not much increases, and that it may be within the reach of all classes of students, the price has been reduced to Re. 1, as. 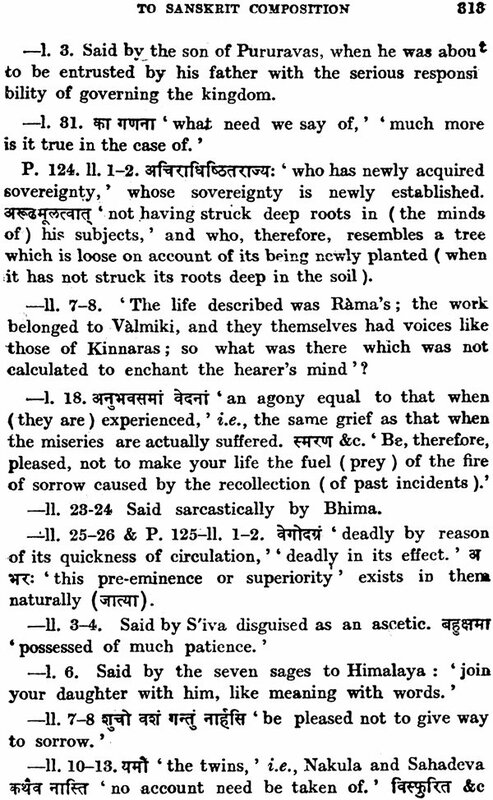 8. the rapid sale of a large edition in less than three years shows that the book, in some measure, supplied a felt want; and it is hoped that the student of Sanskrit will find this edition more useful and a better guide to Sanskrit composition than the first, on account of the improvements effected in it. Before concluding, I must not omit to tender my most sincere thanks to Dr. R. G. Bhandarkar, who was kind enough to spare time to go over the greater portion of the book with me, and to make several important suggestions which have been mostly acted upon; and secondly, to Mr. Lee Warner, acting Director to Public Instruction who, at the recommendation of Dr. Bhandarkar, was pleased to sanction the work for use in High Schools. My acknowledgments are also due to Dr. Morell, Professor Bain, and Mr. McMordie, whose works have been useful to me in writing Part IV; and lastly to Mr. M. Sheshagiri Prabh" of the Madras Presidency, who was the first to suggest the addition of Analysis and Synthesis of sentences.